Michael Ashby has kindly drawn my attention to a marvellous short film from the digital news archive of British Pathé. In this five-minute film, dating from 1940, we see a Sinhalese student, played by one Dr M.D. Ratnasuriya, visiting SOAS to be taught proper English rhythm by the professor of phonetics, Arthur Lloyd James, played by himself (“Prof. 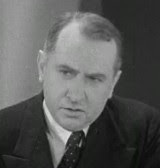 A. Lloyd James, Secretary to the B.B.C. Committee on Spoken English”). Today Lloyd James’s accent seems very dated: particularly in the TRAP vowel, that 1930s sort of tense [ɛ], in the words Jack and Paddington. He has a very open final happY vowel in carefully [ˈkɛəfʊlɪ] and immediately [ɪˈmiːdʒətlɪ]; and a correspondingly open final thankyOU vowel in will you [ˈwɪljʊ]. His THOUGHT vowel in jaw is opener and less rounded than is usual today. He uses a tapped r [ɾ] in intervocalic position, e.g. in very [ˈveɾɪ] and as linking r in your address [jʊəɾ əˈdres]. All of this is typical of the RP of that era. Audio recordings show that although he transformed his speech into something very close to RP, he nevertheless always retained faint traces of his native Welsh accent. I’m not at all impressed with his imitation of American English. By today’s standards his manner towards his student seems starchy and patronizing. But then today you wouldn’t see a newsvendor wearing a cloth cap and with a cigarette in his mouth. Rather unexpected how he explains stress as rhythm, and then the latter as long vs short vowels. Concerning the [hjɐː], I think it fits well to the rest of his pronunciation. His impersonation of the Sri Lankan student was much better than his American impersonation. I noticed that the vowel in "long" at 3:33 and 3:53 was longer than usual, but that might've been because he was stressing the word. Let's keep in mind he may be imitating an American accent of the "posh" mid-Atlantic variety common in movies made in the 1940s. To be fair, he doesn't pretend to pronounce the sentence with an American accent; what he says is that if you make all the syllables long, the result is "something like American." I agree, though, that he confuses matters by conflating stress and syllable length. In his mimicry of the non-English pronunciations, he gives full stress to unstressed syllables, including the word "the" (which he pronounces as [ði(:)]). In your transcriptions of very and address, you've used [e] rather than the expected open e (which for some reason I can't type in this comment field). Did James really say "vairy", or is this a typo? @acw: Like many British phoneticians, I write the DRESS vowel as /e/. I am aware that other authors, including particularly North Americans, write it /ɛ/. For discussion, see http://www.phon.ucl.ac.uk/home/wells/ipa-english-uni.htm , sections 6-7. The description on the web site concludes with the normal apotropaic formula, which you have (unconsciously?) echoed: "...the Professor seems very patronising and strident in his teaching method. His attitude might even be interpreted as racism." Might it? By whom? He looked a little stiff and nervous to me, and of course was not a professional actor. Oh, I see... if we at British Pathé 'notice' this, then we can't be accused of racism ourselves for making the clip available, can we? Political correctness poisons everything now. I was surprised by the use of "talk English" where I would have "speak". Is this a generational thing? U/non-U? or just me? This is a gem! And "talk English" has always been fine with me, though a (US) countryman once pounced on in it my speech. The ending is lovely - he still has his accent, but the new prosody of his question got him easily understood. It's a nice clip, and certainly suggests that Harry Enfield's observation of "Mr Cholmondley-Warner" was pretty spot-on.